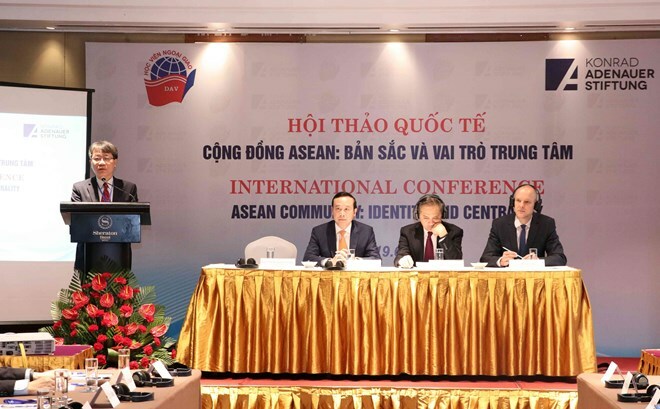 Hanoi (VNA) – An international seminar on the identity and central role of the ASEAN Community took place in Hanoi on March 19. The event gathered over 100 representatives from the Foreign Ministry, embassies of ASEAN member states and dialogue partners in Vietnam, as well as Vietnamese and international scholars. Participants discussed opportunities and challenges to the bloc’ identity and central role in the current context, as well as the role of different social groups in building a people-centred ASEAN Community. They also shared experience and gave recommendations for Vietnam, as the country will become the rotating ASEAN Chair in 2020. Assistant to the Vietnamese Minister of Foreign Affairs Nguyen Van Thao said the five-decade development of the community based on its past achievements and its importance to each member state and Southeast Asia as well as the India-Asia-Pacific region in a broader sense have made its identity and central role, which determine the vitality and prospects of ASEAN in the coming time. Thao elaborated that the community’s identity aims at building a people-centred ASEAN, connecting people from its member states. He noted ASEAN’s central role has been applauded by its partners and has contributed to sustaining peace and stability, protecting the bloc’s interests, as well as ensuring the member states’ voices to be heard regarding international issues. Fostering the identity and central role is a key task that requires concerted efforts from all members, Thao said, adding that rotating ASEAN chairs should lead the bloc to be linked in a common identity and be self-reliant and highly adaptive in a changing world. Peter Girke, Country Representative of the German political foundation Konrad-Adenauer-Stiftung in Vietnam, said Vietnam, which is excellent in community building, will benefit from the ASEAN Community when taking over the chairmanship next year. Former Indonesian Foreign Minister Marty Natalegawa expressed his confidence in Vietnam’s central role, vision, and leadership, which could push the community’s position to new heights. (ASEAN) now comprises Brunei, Cambodia, Indonesia, Laos, Malaysia, Myanmar, the Philippines, Thailand, Singapore and Vietnam.